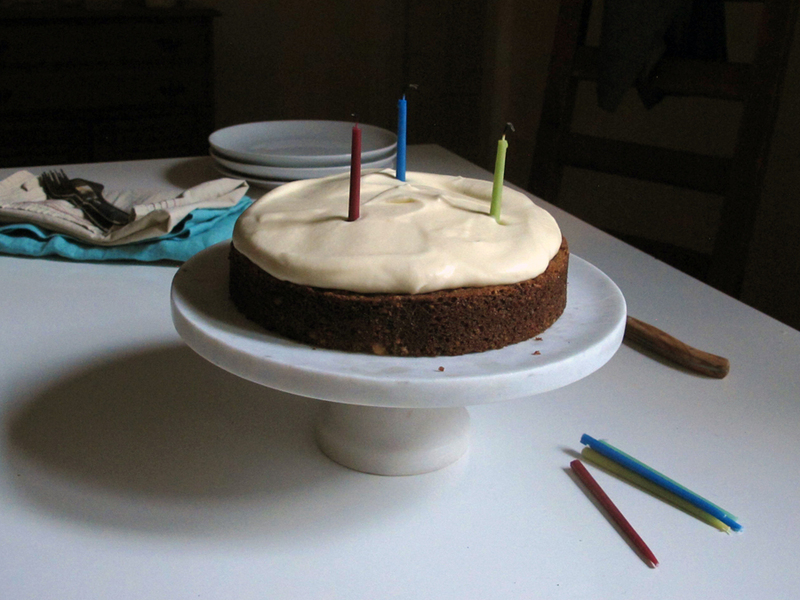 Every year, I look forward to making my own birthday cake. A few years ago there was an orange blossom and cardamom scented angel food cake with a drippy dark chocolate shellac. Before that, a pink, double-layered sugar-butter bomb from The Sweeter Side of Amy’s Bread. Last year I tried out zucchini and hazelnuts in a different cake format, as a two-layer thing frosted with Hervé This’s Chocolate Mousse. That was fine, but—and maybe this is something that happens as one gets older—it was a bit much. I guess I’m getting picky. Desserts that offer the illusion of lightness—a buoyant, airy texture; a fresh, citrusy finish to a meal—are really my favorite. In terms of nutrition they’re exactly that, an illusion, but if there’s another thing to add to the list of refinements and strong opinions I’ve developed with age, it’s that life is too short for supbar dessert. I’d rather eat dessert less frequently, but make it count when I do. So here’s this blog’s first-ever cake: A buttery, sturdy cake that gets its deep sweetness from toasted hazelnuts and a relatively small amount of brown sugar, moistened with grated zucchini and a touch of olive oil. 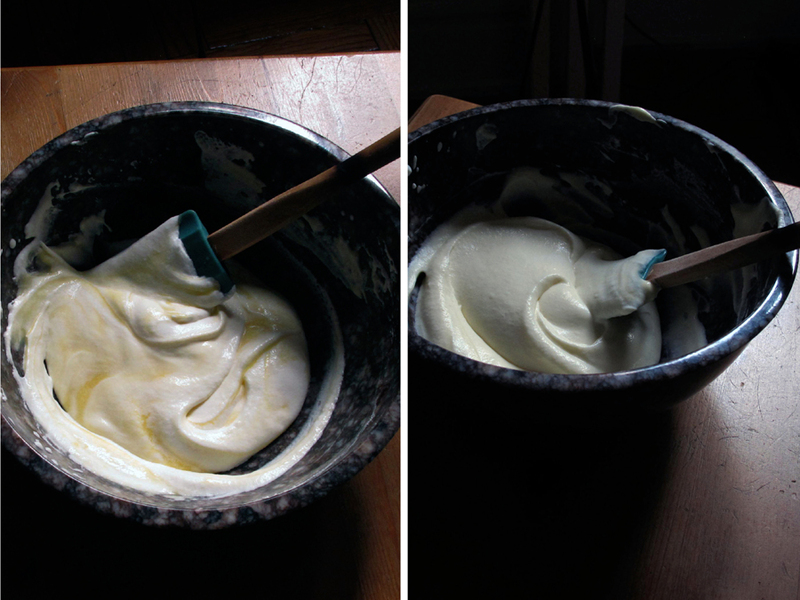 Then the kicker is a loose cushion of “lemon curd whip”: this is based on a suggestion alongside the lemon curd recipe in Alice Waters’ The Art of Simple Food—a book I turn to all the time for its straightforward, reliably great recipes—where you fold lemon curd into whipped cream and then use it as frosting. The curd stabilizes the whipped cream, and the cream both adds airy body and softens all the sharp aspects of the curd. But most importantly it just tastes like what I’d prefer all frosting to taste like. It’s light, uncloying, and elegant; different, but a lot better than buttercream. A final note: This is a cake that violates one of my recipe rules, which is you can use either the KitchenAid stand mixer or the food processor but never both in the same recipe. But I couldn’t get around it this time, and in any case, rules have limits. Use the grating attachment for the zucchini before grinding the nuts, which at least doubles up the food processor’s utility. 1. Preheat the oven to 325ºF (180ºC). Line the bottom of an 8-inch inch springform pan with parchment paper then grease sides and bottom of the pan with butter. 2. Spread out the hazelnuts in a small baking vessel and roast for 12 to 15 minutes, until lightly golden brown and fragrant. Cool. Rub off as much of the papery skins as you can manage. 3. Combine the grated zucchini with the salt in a colander and set aside in the sink to drain for 10 minutes to drain. Then extract out as much liquid as possible by grabbing the vegetables in fistfuls and squeezing. 4. Combine the cooled hazelnuts, 2 tablespoons sugar, and lemon zest in a food processor and pulse until finely ground and mealy. 5. Whisk together the flour and baking powder in a small bowl. 6. In a stand mixer, cream the butter and brown sugar on medium-high speed until well combined and a somewhat fluffy, about 3 minutes, scraping down the sides of the bowl as necessary. Add the egg and yolk, olive oil, and vanilla, beating well on medium-low speed until incorporated (it may look a little curdled, but don’t fret). Add the dry ingredients, mix on low speed until just combined. Fold in the ground nuts and drained zucchini. 7. Transfer to the prepared pan and smooth the top with a spatula. Bake for about an hour, until a tester inserted into the center comes out clean and the cakes start to pull away from the sides of the pans. Cool completely on a wire rack. Run a thin knife around the edge of the pan and unmold the cake. 8. Make the topping within an hour or two of serving: Beat the cream until you have ribbony—but not stiff—peaks. Carefully fold in the curd, taking care not to deflate the cream. Pile on top of the cooled cake and smooth with a spatula or offset spatula. If you feel the need for additional garnish, a few swipes of freshly grated cinnamon or nutmeg on a Microplane would be nice. Kept in the refrigerator, the cake will keep—even with the topping—for a few days. Let it warm up a bit before you serve it. If you have a cake carrier, store it in that. Otherwise, you can place the cake on a plate or platter and put an overturned 9-inch spring-form pan or other similarly sized bowl on top to serve as a lid. * I only made this with homemade lemon curd, for which there are several recipes online. Alice Waters’ recipe in The Art of Simple Food is my go-to, and it always comes together much more quickly than I expect it to (you can make it while the cake is in the oven). Store-bought, jarred curd, though always less creamy and more jam-like than homemade, would work just as well. Looks really simple and delicious. Plan to make it one day. Anyway, thanks for the post and good luck.